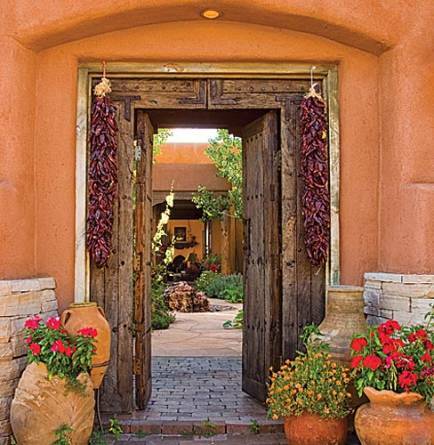 When the time comes to inhabit your own unique corner of New Mexico by building that solar adobe under the vast skies of the enchanting desert—or that pied-à-terre in Santa Fe, modern farmhouse on an irrigated valley plot, fishing cabin in the mountains, getaway by a lake, ski-in chalet, or urban studio near a university—how do you get started? Building a new house, or finding and then significantly renovating an existing one, might seem daunting. Fortunately, hosts of builders, architects, interior designers, real estate agents, and landscapers have all the answers. In this guide you’ll find directory information about their roles, questions to ask when screening them, and a list of organizations you can contact to help you get started with your home project. The directory also includes home tours and trade shows where you can meet these professionals and see their capabilities firsthand. If you can’t attend the events, visit their websites, which offer useful information; the association sites include search features connecting you directly to professionals ready to start your project across New Mexico. Note that these organizations won’t give you referrals—they typically can’t recommend one builder over another—so be sure to ask for references as you assemble your team. Also, because some organizations rely on volunteers, they don’t have permanent staff or points of contact. Use those groups’ general e-mail addresses to reach them, or visit their websites for contact information for their current officers. ■ How will the architect gather information about your needs and goals? ■ Will you be dealing with the person designing your home? ■ How busy is the architect? ■ How does the architect establish fees? ■ What are the steps in the design process? ■ What will the architect show you along the way to explain the project? Will you see models, drawings, or sketches? A builder can manage the project, including finding a lot, connecting you to financing, hiring an interior designer, and bringing in a landscaper. “Builders typically have an inventory of lots. If you find an area you like, see which builders are working there,” says Jim Folkman, executive vice president of the Home Builders Association of Central New Mexico. You can also go directly to the developers themselves, who often maintain extensive websites. Design-build contractors offer turnkey solutions, with an in-house designer or architect working with you on the plans, a construction superintendent overseeing the hammer-and-nails (or adobe-and mud-) part of the project, and an interior designer to help make it feel like home. According to Jack Milarch, CEO of the New Mexico Home Builders Association, “A lot of builders and their customers get together through websites, especially custom builders,” so you might start online. Check the local HBAs’ builder listings. Many have councils focused on custom building, green building, and remodeling. If you time it right, you can hook up with a contractor during a home-builder tour. Steve Chavira, managing director of the Las Cruces Home Builders Association, says you should insist on a licensed contractor who can provide current references and who belongs to the local HBA, because “We help them make sure they’re up to date and up to speed on all the safety, permitting, and regulatory issues.” It’s also helpful to review the builder’s contract documents, which offer a lot of insight into how the builder does business. Chavira provided the following questions for screening prospective builders. ■ How many homes has the builder built, and how long has he or she been in the industry? ■ Who will manage the project on site: the builder, or a superintendent? ■ If it’s a remodel, how much of the work will the builder subcontract? Does that indicate a lack of expertise? ■ If it’s not a custom home, , will one person guide you through completion? “Interior designers are key partners in either a new home construction or remodel,” says Karen Lankford, past president of the New Mexico chapter of the American Society of Interior Designers and junior designer at HVL Interiors, in Santa Fe. Designers address lighting, acoustics, space planning, organization and storage, scale, aging in place, and green goals. “A space must serve its purpose, but also give the user an emotional connection,” she adds. ASID has a consumer checklist on its website, Lankford says, to help you work with a designer. Look for one who’s licensed and has ASID and International Interior Design Association credentials. Lankford and Santa Fe interior designer Lisa Samuel, ASID, of Samuel Design Group, suggested the questions below. ■ How do interior designers charge for their services? If by the hour, how long do they estimate the project will take? ■ What additional services do they offer? ■ Do they have an established network of proven craftspeople and tradesmen? ■ Do they have enough time to do your project? You might feel most comfortable with a real estate agent, whether you’re looking for an existing home to remodel, a building lot, a custom home builder, or a production-built house. ■ How long has the agent been in the business, and how long locally? ■ Will the agent help with finding financing? ■ Is the agent full- or part-time? ■ Will the agent show all properties, not just the agency’s listings? ■ Can the agent provide references from recent clients? In most of New Mexico, the climate makes outdoor living essential to every home. That same climate—arid, sunny, prone to extremes, and often windy—determines what works and what doesn’t. To find out, consider working with a landscape designer or knowledgeable landscaping contractor, whom your builder might recommend. Otherwise, landscape designer Judith Phillips, owner of Design Oasis in Albuquerque and author of New Mexico Gardener’s Guide, recommends finding landscape designers and contractors through homeowners associations or the Association of Professional Landscape Designers (apld.com). ■ Who supervises the crew, and how much is the contractor on site? ■ Is the work guaranteed, and for how long? ■ What plants does the designer or contractor suggest? ■ What are the options and alternatives for specific features (for example, a shaded patio or a windbreak)? ■ How long will the project take? If delayed, can it be canceled, with money back? ■ What are the long-term maintenance needs? Can the landscaper integrate principles of permaculture into the design?